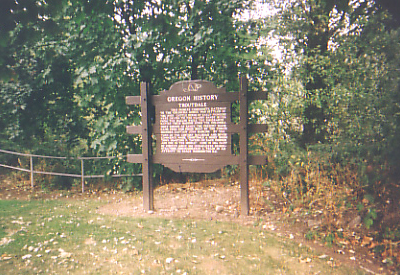 This pioneer community gateway to the Columbia Gorge was settled in the 1850’s. Cattle herds of early pioneers were driven to the nearby Sandy River from the Dalles while the emigrants rafted their wagons down the Columbia. First known as Sandy, the present name came from fish ponds built by the town’s founder, Captain John Harlow. By the turn of the century railroad and river commerce made Troutdale a noisy boom town boasting “a tavern on each corner and one in the middle.” Here in 1894 part of Coxey’s Army, 500 unemployed demonstrators, commandeered a train in an attempt to reach Washington D.C.